According to the Federal Reserve Bank of New York’s latest Household Debt and Credit Report, total household debt outstanding rose by $306 billion, 2.7%, between the fourth quarter of 2013 and the fourth quarter of 2014. At the end of 2014 there was $11.8 trillion in household debt outstanding. By virtue of its size, the increase in mortgage debt outstanding over the year, $121 billion, accounted for much of the increase in total household credit outstanding. Auto loans, $92 billion, student loans, $77 billion, credit cards, $17 billion, and other consumer debt, $18 billion, also contributed to increase in total household debt outstanding over the 2014. The outstanding amount of home equity lines of credit fell by $19 billion. However, in year-over-year percentage growth terms, auto loans, 10.7%, and student loans, 7.1%, led the way. Outstanding credit card debt rose by 2.5% and mortgage debt increased by 1.5%. The amount of home equity lines of credit outstanding fell by 3.6%. Although the year-over-year growth in mortgage credit outstanding, 1.5%, was below the 2.7% growth in total household debt outstanding, it represents an acceleration from the rate of growth recorded over the year of 2013. As Figure 1 below illustrates, following four successive years of declines, 2014 marks the second consecutive year of growth. The rate of growth in 2014 was 1.3 percentage points greater than the rate recorded in 2013 and is similar to the rate recorded in 2008, the last year that mortgage debt outstanding registered annual growth. 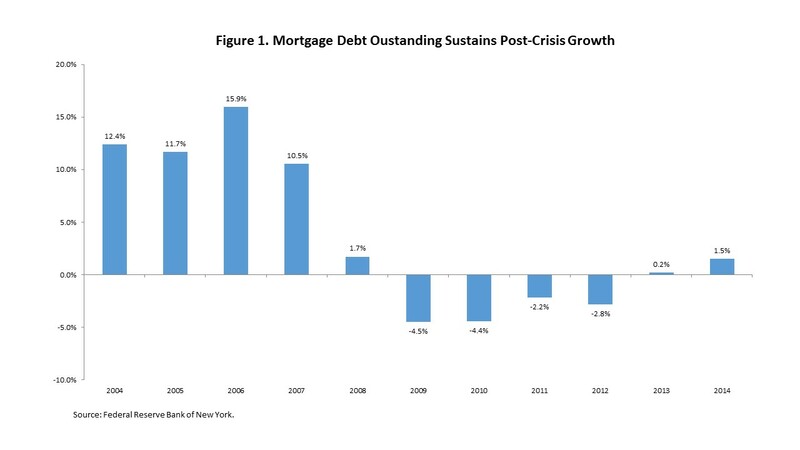 Despite the presence of some risks, mortgage debt outstanding should expand further in 2015. Part of the reason that mortgage debt outstanding should rise in 2015 is because the serious mortgage delinquency rate is returning to its pre-recession level. At the same time, mortgage originators expect their mortgage business to grow. According to Fannie Mae’s Mortgage Lender Sentiment Survey, and as illustrated in Figure 2 below, 88% of respondents expect to grow their mortgage origination volume going forward, while 12% expect to maintain their mortgage origination volume. 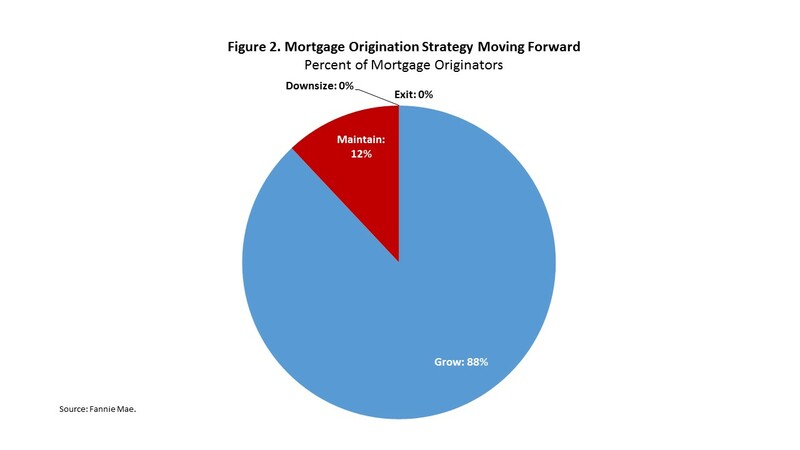 No respondent expects to either downsize their mortgage origination volume or exit the mortgage origination industry. On net, mortgage originators expect home-buying, specifically first-time homebuyer and move-up homebuyers, to largely account for the 2015 growth in their mortgage origination business. The Mortgage Lender Sentiment Survey asks respondents to identify which segments of their mortgage origination volume will see an increase in their share over 2015, reminding respondents that some segments will have to decline over the year. Figure 3 shows the net results from that question, the difference between the percentage of respondents expecting a specific segment to see an increase in its share of mortgage origination volume in 2015 and the proportion of respondents expecting that specific segment to see a decline in its share of mortgage origination volume in 2015. As illustrated by Figure 3, the largest percentage of survey respondents, on net, expect the share of mortgage origination volume for first-time homebuyers and the share for move-up homebuyers to increase in 2015. On net, 41% of mortgage lenders expect the share of their mortgage origination volume for first-time homebuyers to rise in 2015, while a net of 30% expect the share of mortgage origination volume for move-up homebuyers to rise in 2015. Although not near the extent of first-time and move-up homebuyers, a net proportion of survey respondents expect the shares of mortgage origination volume for other home-buying segments, relocation homebuyers, move-down homebuyers, and second-home homebuyers, to also increase in 2015. 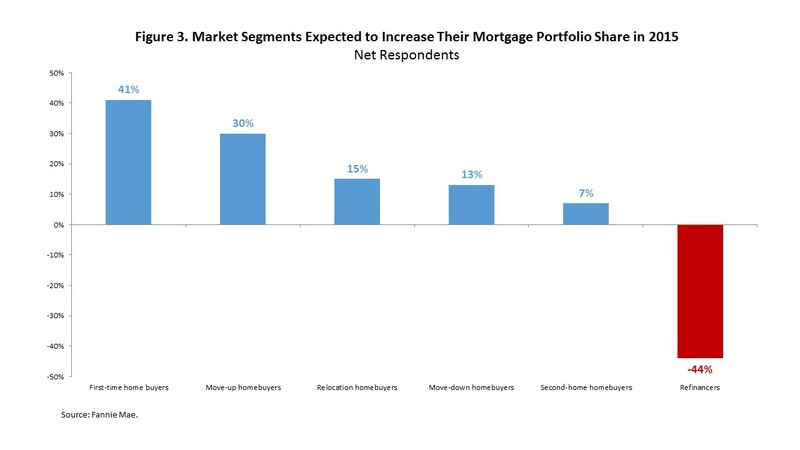 Meanwhile, a net of 44% expect the share of mortgage origination volume for refinancings to shrink in 2015.